The main attractions are the beaches. Most offer water activities such as jet skiing, banana boats, water skiing, snorkeling, diving etc. are available. The last two decades the beach has been witness to a huge transformation. From a few simple wooden houses Chaweng Beach is now swamped with go-go bars, pubs, pizza joints and bars. The nightlife has become legendary which sometimes doesn't always attract the best in quality tourists. It does get crowded at peak times so always book ahead for accommodation. Although not dissimilar to Chaweng when it comes to exciting nightlife, the beach is generally in a better condition and whilst busy, it is not as crowded. If it's a quiet beach holiday you are after then Lamai is not for you. However the northeast end of the beach tends to be a bit quieter and is lined by bungalows, quality guesthouses and luxury resorts. Although developed with the bars and restaurants, the two kilometer long Big Bhudda Beach as it is known, offers a good mix of swimming and lovely views. Once a month the island plays host to a Full Moon party. More suited for families, this is a good spot for sunbathing and relaxing. The beach slopes very gently into the sea resulting in shallow waters ideal for children. Although being only ten minutes from Chaweng it could not be more different – a good beach for those who want peace and quiet. Ideal for relaxing. Located in the north of the island Bophut Beach is less commercialized than Charweng but it still boasts many bars and restaurants. The area is a popular resort for diving holidays. 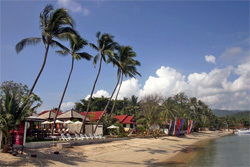 Located on the main road directly behind Bophat Beach. The show, performed in an open air theatre, includes performing elephants and trained monkeys. However, attitudes have changed in recent years and many question the morality of capturing and training wild animals. 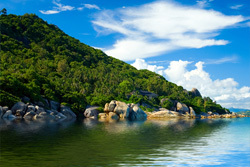 Near Na Thian Beach, south of Lamai,the Samui Aquarium and Tiger Zoo provides a good day out for all the family. This modern building is home to a vast array of vibrant tropical fish, turtles, stunning coral and other marine exhibits. The Tiger Zoo is home to leopards and Bengal tigers. This is the most famous temple on the island. Its fame is due mainly to a mummified monk on display. Sitting upright and encased in a glass casket, devotees offer up incense and flowers. The mummy is, in fact, a meditation master who was a very revered former abbot of the temple.